This is Page 1 of 3 - the best of March 2019! 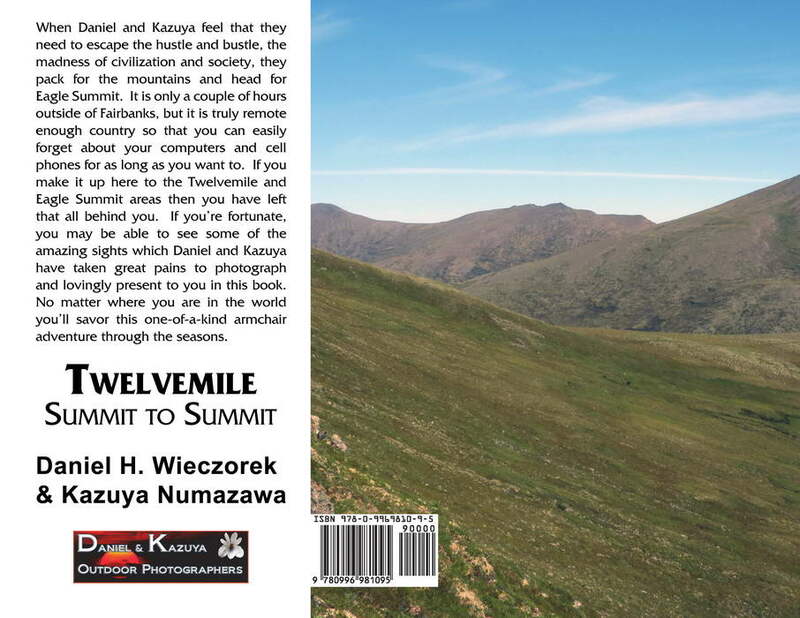 This page shows only some selected pages from our newest book Twelvemile: Summit to Summit, a book for which the release date is April 1, 2019. In the past all of our books have been formatted as 8 inch x 10 inch for the paperback editions and generally the same or else as 6.14 inches x 9.21 inches for the hardcover editions. This book, however, is a true coffee table book, formatted as 11 inches in width x 8.5 inches in height. This book has about 175 photos and of those, some 75 of them are 2-page spreads, that is, they cross the page center. Click on any thumbnail to begin. 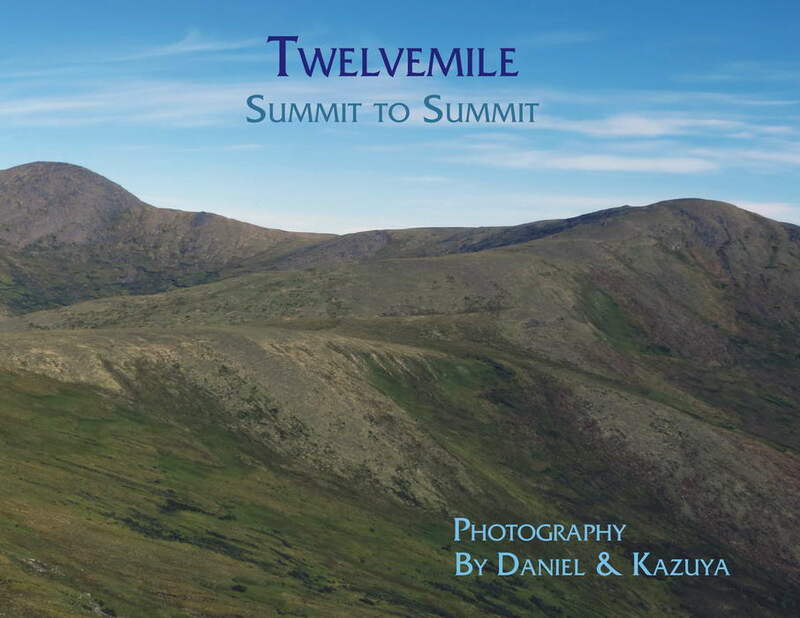 Here are images of the front and rear covers of Twelvemile: Summit to Summit. You will most likely note that this is quite different from our usual cluttered book covers. I had a great deal of help and advice from an Australian friend who taught me that "less is more" and that for this book the cover text and everything else about it should look elegant. He rejected many of my trials, but he finally said "that's it!" Thank you Josef. 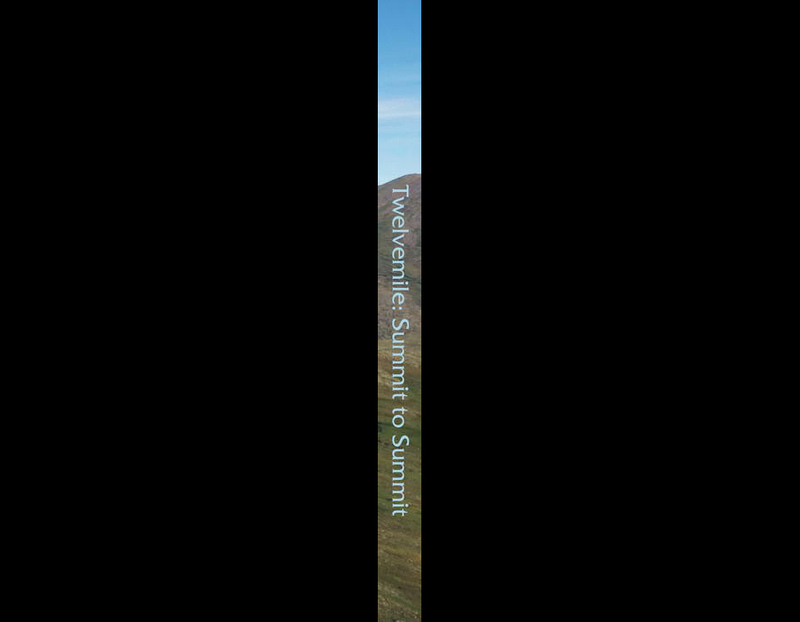 Here is the spine of Twelvemile: Summit to Summit in first position and in second position is the entire cover as you would see it if you laid the book flat down on the table with the cover facing up. If you would like to see the details page for this book CLICK HERE. You can go to the Amazon order page from there as well as be able to download a PDF of the book. This book is available in both paperback and hardcover editions. Here are some example 2-page spreads from the book. Keep in mind that the total width of the book, when open on the table, will be nearly 22 inches. The first image in this row shows pages 6 and 7, the second image shows pages 16 and 17 and the third image shows pages 26 and 27. Here are three more examples of 2-page spreads. The first image shows pages 36 and 37, the second image shows pages 46 and 47 and the third image shows pages 56 and 57. In this row are three images which are not 2-page spreads. The first image shows pages 66 and 67, the second image shows pages 76 and 77 and the third image shows pages 84 and 85. The first image in this row shows pages 86 and 87, the second image shows pages 96 and 97 and the third image shows pages 106 and 107. Please note that in the third image you can see both the sun and the moon. Here are the images for pages 116 and 117, 126 and 127, and then pages 136 and 137. Here are the images for pages 142 and 143 in first position, pages 144 and 145 in second position and pages 156 and 157 in third position. The first image in this row shows what pages 162 and 163 look like. The second image shows pages 174 and 175, and the third image shows pages 180 and 181. These two images show pages 186 and 187 in first position and pages 194 and 195 in second position. Here are the final two images which show pages from the newest book, the first image shows pages 202 and 203, and the second image shows pages 206 and 207. The book is a total of 228 pages in length. If you want to see more, then please go to the link for this book, back in Row 2 and click on it.